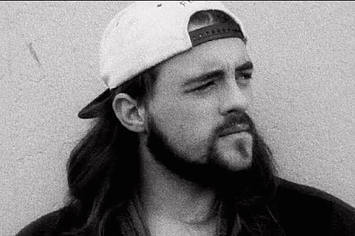 Silent Bob presented as a man in his early 30s who was dressed in a backwards hat, long coat, and jeans. After we greeted him in the waiting room, he used charade-like behavior to ask if we would hold the session outside so that he could smoke cigarettes. After going to an outside area, he leaned against a wall, and continued to communicate mostly through emphatic facial expressions and gestures rather than speaking. A review of Silent Bob’s paperwork indicated that he was court-ordered to treatment following charges of possession of marijuana with intent to sell. The police report stated that he and his friend, Jay, were driving around with a deployed airbag when a police officer pulled them over for “suspicion of mischief.” The police officer then searched their car and found two pounds of “Jamaican Landswolf” marijuana. The prosecutor wanted Jay and Silent Bob to be sentenced to prison for ten years, but the judge ordered them to complete drug rehabilitation instead. Silent Bob completed a minimum of eighth grade (when he won the science fair) and likely continued beyond that. However, details could not be confidently discerned from Silent Bob’s gestures. After completing school, he became a self-employed drug dealer with his best friend, Jay. He and Jay particularly enjoyed selling marijuana in front of a Quick Stop convenience store in New Jersey. Another source of income for Silent Bob was from a movie (Bluntman and Chronic) that was developed from a comic book starring a character based on him. Little is known about Silent Bob’s family history and not much could be gleaned from his nonverbal behavior on this topic either. There was one mention of his mother, in that he won that eighth grade science fair by turning one of her personal belongings into a CD player through the use of chicken wire. For this accomplishment, his friend Jay referred to him as an “electrical genius” and “better than MacGyver.” He also reportedly had a cousin named Olaf from Moscow, Russia who was a metal singer. With regard to friendships, Silent Bob spent most of his time with his best friend, Jay, ever since they met as young babies in strollers outside of the Quick Stop. Together, they spent the vast majority of their time loitering, smoking and selling marijuana, and beating up people who were critical of Bluntman and Chronic on the internet. True to his name, Bob was often silent while Jay regaled him and others with crass, colorful stories and commentary. They also enjoyed listening to music together and dancing while loitering. In fact, during one of the rare times when Silent Bob spoke, he revealed that he “always wanted to be a dancer in Vegas.” It should be noted that, as occasions arose to help others, Jay and Silent Bob often stepped up to the challenge. For example, they once helped their friends T.S. and Brodie reunite with their ex-girlfriends and, another time, they liberated animals from a testing facility. Remarkably, they also played important roles in preventing two fallen angels (Bartleby and Loki) from ending all of existence. All assessment information was obtained through behavioral observations and record review (i.e., watching, reading, and listening to ALL the Kevin Smith movies, books, and podcasts). First, due to the nature of the court-ordered referral, Silent Bob was evaluated for disorders related to his marijuana use. According to the Diagnostic and Statistical Manual of Mental Disorders (DSM-5), cannabis use disorder is defined as “a problematic pattern of cannabis use leading to significant impairment or distress, as manifested by at least two” of eleven specified symptoms (e.g., tolerance, withdrawal, repeated use in dangerous situations such as driving, repeated failed attempts to cease marijuana use). Due to the limited communication from Silent Bob during the assessment, we could not conclusively determine whether he met full criteria for this disorder. However, we speculated that he was likely to have met criteria for cannabis use disorder as evidenced by the following symptoms: 1) substantial time devoted to obtaining and using cannabis and 2) the presence of intense cravings to use cannabis. Moreover, he appeared to be experiencing associated impairment in light of his legal troubles. Secondly, Silent Bob also appeared to meet criteria for a second disorder: selective mutism. He exhibited all of the DSM-5 criteria for selective mutism: 1) repeated failure to speak in social situations where one is expected to speak, despite speaking in other situations, 2) the disturbance interferes with social communication, 3) the duration is at least one month, 4) the failure to speak is not attributable to lack of knowledge of spoken language. In summary, probable diagnoses for Silent Bob include cannabis use disorder and selective mutism. Currently, there are several well-established treatments for substance use disorders that have been tested in rigorous scientific studies. These evidence-based approaches include strategies focused on enhancing motivation for change (motivational interviewing, motivational enhancement therapy), identifying and changing thoughts and behaviors that contribute to the substance use problem (motivational enhancement therapy plus cognitive-behavioral therapy), and participation in a behavioral program that reinforces drug abstinence (prize-based contingency management). With regard to Silent Bob’s selective mutism, existing scientific evidence points to cognitive-behavioral approaches as effective. These approaches teach individuals with the disorder skills for adaptively coping with and reducing the obstacles to their verbal communication, while behaviorally reinforcing them for communicating through spoken language. At a follow-up session six months and two days later, Silent Bob denied the presence of any cannabis use disorder symptoms. Through a series of questions that Silent Bob responded to with head nods, head shakes, gestures, and occasionally drawing pictures, we determined that he had maintained sobriety since our initial meeting. He attributed his marijuana abstinence to his enrollment in a six-month rehabilitation program that utilized the 12 Steps of Narcotics Anonymous. While Silent Bob should be commended for his dramatic behavioral change, there were several risk factors for relapse that were identified. First, his beloved Quick Stop convenience store had burned down. He was reportedly coping with this stressor by loitering in front of a fast-food restaurant (Mooby’s) instead. Secondly, though Jay was also sober, they both continued to sell marijuana. When asked how he would resist smoking marijuana while selling it, he pulled a bible out of his coat. Silent Bob had been raised Catholic and reconnected with Christianity during rehabilitation, which led him to feel that his spiritual connection would prevent a relapse. Nonetheless, it was strongly recommended that Silent Bob explore other occupations in order to reduce his chances of relapsing. Silent Bob is a comedic character that Kevin Smith created mainly so that the character, Jay, had someone on the receiving end of all of his funny behavior. Still, he does exhibit symptoms that are realistically consistent with cannabis use disorder, as outlined above. With regard to selective mutism, Silent Bob exhibits many of the actual symptoms of the disorder. However, it is worth noting that the disorder is extremely rare in adults and tends to occur in children. Moreover, it is likely that Silent Bob would speak more frequently to Jay in the context of their close friendship. In children with selective mutism, they often speak with their family members and sometimes close friends, but are silent in other settings (e.g., in school, with strangers). As mentioned above, Kevin Smith was not specifically aiming to have Silent Bob represent a person suffering from mental health issues. However, Silent Bob is certainly a likable character. Furthermore, it is very clear from reading Kevin Smith’s books and listening to his podcasts that he has great compassion for his friends who have struggled with substance use and other mental health issues. He is openly supportive and helpful to his friends in real life, and in this way, he helps to reduce stigma surrounding these mental health issues. Overall rating: On a scale of snoogans to snootchie bootchies, we rate this portrayal as snootch to the nootch!